Not much to say about this. 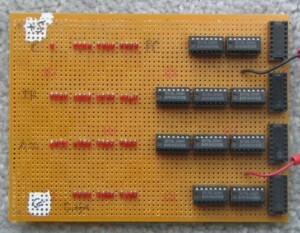 It is simply LED's with built-in current limiting resistors, connected by way of buffers to the register outputs. It is not needed for proper operation of the computer, but it is critical in the troubleshooting phase. The display is also pleasing to watch when the computer is running. With a slow clock, it is easy to follow what the computer is doing.